Witty and hard headed girl. I am ALL IN. All the way in. Not just the tip, I’m ALL THE WAY THERE. 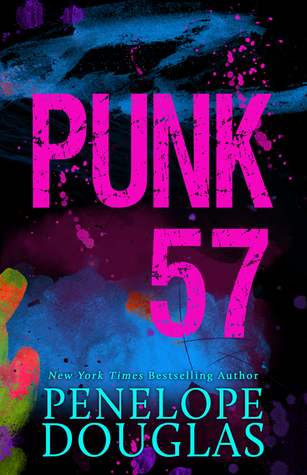 So, if you don’t like that type of thing, don’t read Punk 57. I say that in the kindest way. And don’t roll your judge-y eyes at me. That NA genre angst is such a guilty pleasure for me. But only when it’s done right, and let me tell you: Penelope did it right. My tiny heart squeezed a few times and I got goosebumps while reading more than a few times. I’m a complete sucker for it. Yes, this was a romance but this romance was way different than the type that you would usually come across. It’s much more than what you are probably thinking that it is, there is just no other way to put it. And not only that- it tackles way more subjects that should be talked about MORE. Especially in high school, and for that, I appreciate what Penelope did. The subject matters and the way she approached them overwhelmed me in a sense mainly because I didn’t see it coming, but I am so glad that it did. They are so important. I also loved how the title fit into the story line. It made everything much more complete for me. I especially loved the characters. Well, the good ones that is. And I really loved Ryen. Which is tough, because a lot of people probably didn’t like her in the beginning and I can see why but her growth is so outstanding. I felt like a proud mama watching her baby bird fly out of the nest for the first time. That’s my girl. The writing was fantastic (no shocker there, I loved Bully), the romance was unique, and the story was not like anything else I have read here lately. The messages inside were very important and touching and for that, I scream to you…READ THIS BOOK. I felt the same way with this one. Misha is everything. Forever.